Clara Greenwich is too young to take on the sole responsibility of caring for herself and her younger sister. She’s just sixteen. She should be focused on school, hanging out with friends, falling in love. Instead, she’s working to pay off the mound of bills her mother left behind when she vanished at the start of the school year. Left alone with her ten-year-old sister, Beatrice, Clara discovers that she is now the parent, the provider, and the responsibilities grow to be more than she can handle. Complicating matters is senior Evan Morningstar who starts pursuing Clara at the beginning of her junior year. She’s confused by this. Evan is a popular, likeable guy. She describes herself as a nobody—a quiet, intensely shy girl who suffers from social anxiety. She wants love like any teenage girl, but she’s terrified to let Evan get close, to discover her secrets. His gentle persistence eventually wins out, however, and she has no option but to open her heart to him. When Clara’s responsibilities prove too great, she begins a slow descent into depression, making dangerous choices that threaten her relationships. She can stay trapped in her despair or discover redemption—how to forgive the past and love again. Reading this book took me on one heck of a ride! I went through so many emotions that at one point I just wanted to sit in a corner, hug my tablet, and stare into nothingness. This book is sad, really sad. I'm not going to sugarcoat it in any way. But what made me like this book was how strong the message was, and how the author developed the characters as the story progressed. The overall feel of the book may have been sad, but there was a point to it all. Clara's obviously too young to handle so much responsibilities but she took them on anyway. Even if their living arrangements were horrible, Clara and Bea's bond remained intact. That's actually one of the reasons why I liked the book - the author was able to show how strong Clara's relationship was with her sister all throughout. I really enjoyed every chapter that involved Beatrice. She's such a fun character! She's witty and she talks like a grown up but she still had stubborn moments which shows that she's still very much a kid. I think having such a well-painted picture of Clara and Bea's sisterhood brought balance to the story. It made all the sadness bearable for me. While this book is primarily about Clara's sad home life, it's also about falling in love for the first time. Evan... oh yeah. Evan is definitely on my list of Book Boyfriends. I think he also brought balance to the story. I loved how Clara slowly learned to trust Evan and to accept him in her life. The tenderness and compassion he showed to Clara was refreshing amid all the chaos. One of the brilliant parts of the book is actually shown on the 1st picture of the guest post! When I got to that part it was sad and shocking but it was so beautiful in a tragic way! I know it doesn't make sense but trust me, when you read the book and you reach that part you'll know that it deserves a slow clap. It truly was "pretty damn perfect!" I actually liked the parts wherein Clara started entering the depths of her depression, simply because of how well-written it was. All the emotions were there and it was told carefully in such a way that I felt a deeper sense of connection to all the characters and to the story. This is the first time that I actually enjoyed a sad book. It was sad... but beautifully written. It showed the harsh reality of life and how far people would go when pushed to the limits and when given no other choice. I liked that in the end, Clara was able to redeem herself through love and trust, with the help of the people around her. Okay, that line is the line that all writers want to hear about their work. 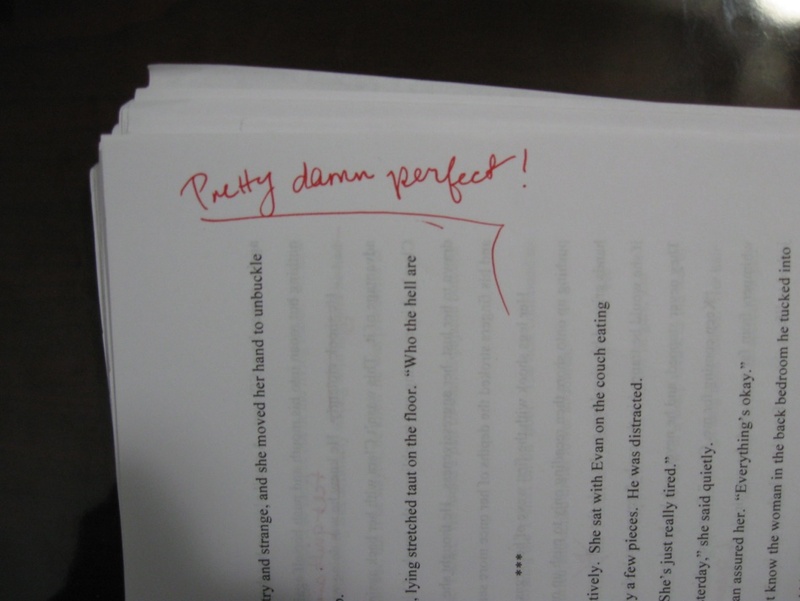 Even better when it’s written on your manuscript! Was this line written on my manuscript? Yeah. You don’t believe me? You wanna see? Was this line referring to the manuscript in its entirety? Please. Try one scene, but you know what? I’ll take it, thank you very much. 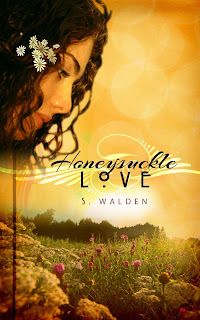 I promised Julie Lindy her own post because what she’s done for me with Honeysuckle Love is nothing short of amazing. I asked her to be a critique partner (knowing that she has an extremely busy job... yes, I’m completely self-absorbed), and she agreed. I was thinking, Critique partner. Yeah, so that’s just you telling me what works and what doesn’t. What you believe and what you don’t. She shared all of that in emails. But then I got my manuscript back in the mail. And to take a line from my own book (again, because I’m completely self-absorbed), my eyes went “as big and as round as saucers.” Julie wasn’t just a critique partner. She elevated her status to Editor. And thank God! I thought I was good at editing. I am so not good at editing. But she is. That’s her job, what she does for a living, and I see why. Incidentally, I asked her to be my editor for life, and she agreed. This meticulous woman went through my manuscript page by page and caught everything. Questioned everything. Struck lines that sucked. Was brutally honest with me. My favorite? “Yawn. Not interesting. Sorry.” I laughed out loud. And then I reread my lines and thought, Yeah, this isn’t interesting, and deleted them. She did two important things for me: 1) She made me revisit my overuse of adverbs. I should know better after reading Stephen King’s On Writing (he’s got some things to say about adverbs and it’s pretty funny), but I’m wordy. And apparently I thought I needed a bunch of words in my book that ended in –ly. Did I take all of the adverbs out? No way. And that’s my sin. 2) She zeroed in on my passive voice and made me change it to active. I didn’t even think I wrote like that, but once it was pointed out, I wanted to cringe. Oh, the horror. I don’t want to be a timid writer, and passive voice is all about being a timid writer. Why do you care about any of this? Well, I’ll tell you. 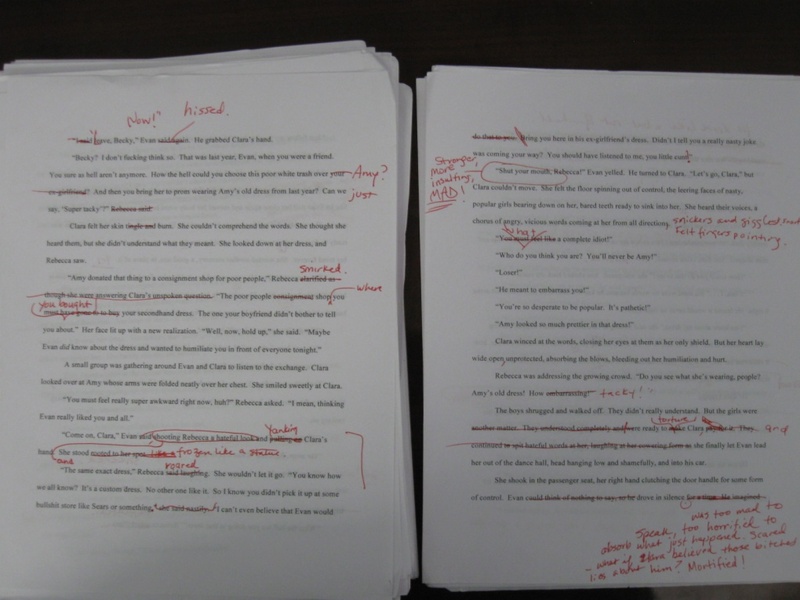 If you read my manuscript as the final version today, you’d be pissed off. And I wouldn’t blame you. Here’s the thing: Writing a story is, first, just about the story. But once you finish the story, the real work starts. For a lot of writers, they think the story-writing is the hard part, and once that’s finished, they’re finished. Read any bad books lately? I’ve spent just as much time revising and editing HSL as I did writing it. And it’s been painful. 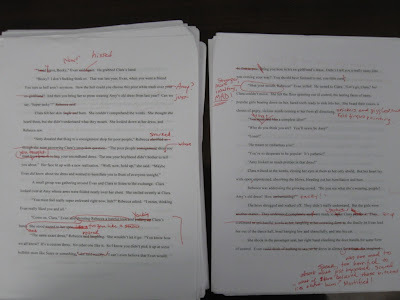 It took me three full days with just Julie’s manuscript edits. 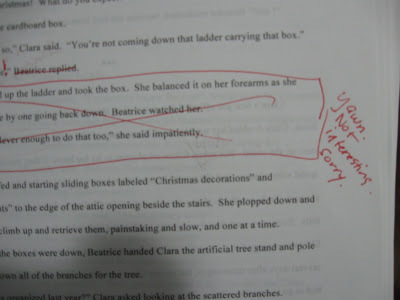 Not revisions. Edits. Those are two totally separate things. 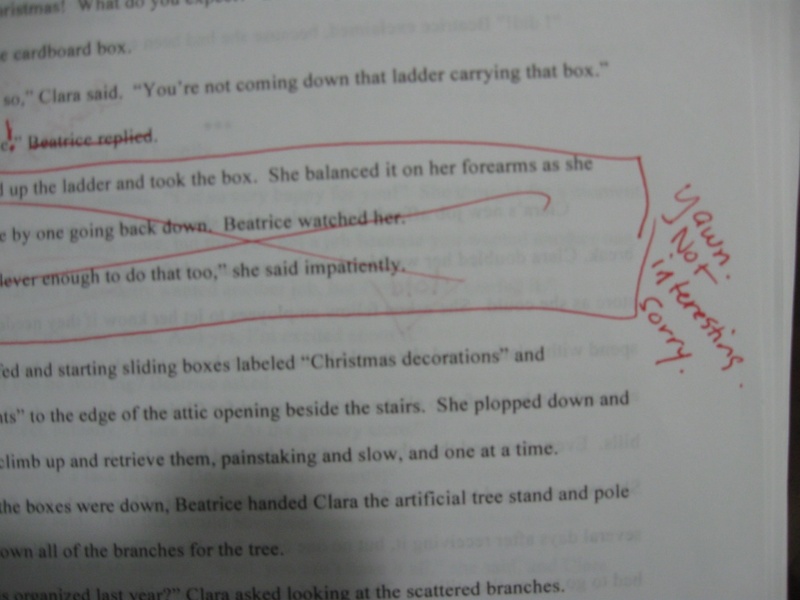 A revision would be a reworking of a sentence. An edit would be putting in a comma or taking one out. So yes, I spent three full days going through and fixing the punctuation errors in my manuscript. S. Walden used to teach English before making the easy decision to become a full-time writer. Easy because once she completed a full-time graduate program, there weren't any teaching jobs anyway! 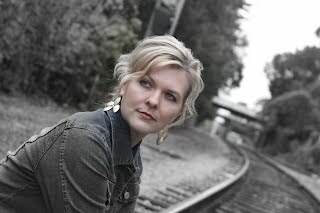 She lives in Georgia with her very supportive husband who does not read fiction and has a difficult time understanding why her characters must have personality flaws. She is wary of small children, so she has two Westies instead. Her dreams include getting through her next big writing project (a three-part series) and owning and operating a beachside inn on the Gulf Coast. Her husband's dreams for her include getting her Ph.D. so that he can tell people he's married to a doctor. Thank you so much for such a thorough review of HSL. Quite frankly, it blew me away! I appreciate your honesty about the heaviness of the novel because it is just that: heavy and sad. I want readers to be prepared for that, but I also want them to see a story of strength and hope, forgiveness and unconditional love. It's there - that reward at the end - if the reader is faithful. Beautiful blog. Beautiful reviews. Keep up your amazing work. And to your members and followers, thank you so much for taking the time to read about me and my work. Check out my blog (listed under Contact nformation above) for giveaways starting after my tour on Jan. 17th. Thanks for taking the time to read my review! I really appreciate it. Hey Inna. Thanks! I'll check that out now!